This post may contain affiliate links. Click here to read our Disclosure. This week we had a friend ask us how we can travel so much and I realized many others probably have that same question. Unfortunately there is no one quick answer and there is no secret that allows us to travel. 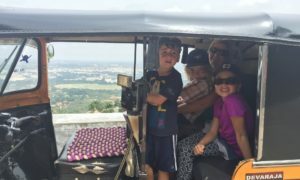 We wrote a post recently about how we do family travel on a budget. Traveling budget style is one of the ways we can afford to take so many trips. We prioritize travel above almost anything else because we believe wholeheartedly in the benefits of travel for kids. We don’t eat out often, we drive one old car, we limit spending on non-essential items and are generally thrifty. Combine that with lots of research to find travel deals, traveling in developing countries and being flexible about where and when we go, and we manage to travel quite a bit. Read my full post on how we plan our travels. But every one’s situation is different and it isn’t easy to see the world when you only have 2 weeks of holiday. We brainstormed a list of ways to travel more as a family. Some are more drastic and entail making major lifestyle changes and others are small adjustments that maintain your lifestyle. 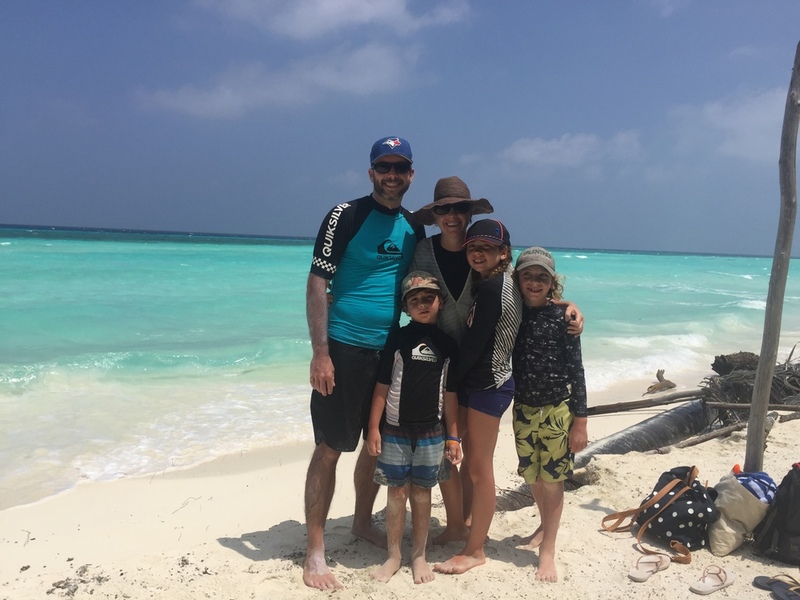 If you are looking to hear from families that are traveling more and how they finance their travels, check out the Family Adventure Podcast. We have been fans of this show since they started and we love how Erik asks each interviewee how they can do it and how they can afford it. Most people want to travel more, but it is often jobs and finances that hold them back. Our goal is to show you creative ways that you can travel more. 11.0.1 Enjoyed Reading this Post? SIGN UP for more. UPDATE: Since this article was so popular, we have spun it into a case study series where every fortnight, we interview a family using one of the below approaches to travel more together. If your goal is more travel, but you just can’t figure out how to make it happen, these posts are for you. They are hugely inspirational, but also give you the information to make it happen in your own life. We learn from a young age the path that we should take throughout life: finish school, start work, get married, have kids, retire. But why do we have to follow that pattern? Why should we spend the best and healthiest years of our lives working with the hope of doing everything we want to do once we retire? We are big fans of “The 4 Hour Work Week” where Tim Ferriss advocates not waiting for retirement, but taking mini-retirements throughout your life. I see so many families online now that are taking 1 year RTW (round the world) trips with their kids; a mid-life mini-retirement. They want to travel with their kids, instead of waiting until the kids are all grown up. In 2015, we took 6 months off of our jobs and spend that time traveling with the kids. Yes, we missed six months of moving ahead in our careers and paying down our mortgage, but we gained so much more. We spent those months sailing a small boat throughout the Bahamas and traveling in Central America. We spent our days together as a family and our kids learned more through our travels then they ever could in a classroom. How you can take a sabbatical? Ask your employer if you can take a year off? Will they hold your job for you? Increasingly employers are realizing the benefit of these leaves where employees return refreshed. In fact in Australia, after 10 years many employees are entitled to a paid long term service leave of 2 months. Some public and unionized workplaces allow employee-funded leaves. Typically you will work 4 years at 80% of your salary and then you have the fifth year off, but still receive 80% of your salary. This is an excellent way to fund a year-long adventure. How to fund a sabbatical/gap year? I realize the idea of taking a year off without any income coming in is really scary. It is breaking from the rat race progression. Many families that take a gap year, save for years to finance their time away. By making simple lifestyle changes like taking the bus to work, cutting out expensive coffees, and reducing spending on non-essentials, you can add to your travel kitty. Other families choose to sell their homes and belongings to fund a long trip. It may seem counter-intuitive, but remortgaging your house or taking out a loan may make sense. Where is the World, Great videos too! Many countries allow either parent to take paid or unpaid parental leave, making it a great time to travel. 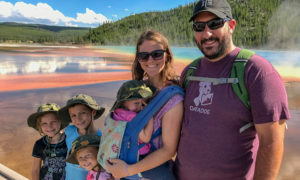 Yes, the thought of traveling with a young baby can be daunting, but there are so many families traveling with little ones these days, even in remote and exotic locations. In fact, I think traveling with a baby is a great age because they are so portable. When my brother and his wife had their first child, they used their parental leaves to spend 3 months traveling between Canada and Mexico by campervan. Their daughter was 6 months at the time time and of course there were challenges, but it was an amazing trip. When we had our first child, we used the opportunity to travel to Europe and Turkey for a month. This is one of the cute villages around late Atitlan… Those little tuk tuks rip around the streets, up hills and along dirt tracks. It’s pretty impressive.. The streets are lined with little stalls, all of them have oodles of colourful textiles. Not to mention the cute cafes and many tortilla stalls. Latin America eat your heart out!!.. it was such a pleasure to collaborate with @hoteltoliman whilst we were there. They give SO much back to the community. Like so many things. They have a house for women fleeing domestic violence and they allow kids with physical disabilities to have their weekly therapy in the pool. The lady that owns it is the most intriguing Guatemalan women. She has done so much voluntary work in her life .. I can’t wait to do the write-up.. 💜✈️🌎 would you visit Lake Atitlan? 🗓3 months 🌏4 countries📍13 destinations 💛Countless joyful moments. When we tell people that we have worked and lived overseas in Malaysia and Australia, they envision that we were sent on these assignments by Paul’s work. In fact, in both cases emails went out that they were looking for people to work in those locations and Paul was quick to put his hand up. Working overseas provides a great opportunity to explore a different area of the world and really get to know a different country. We find that when we are living somewhere new, we are so eager to see and do everything in our new country. In Australia, this has led to camping trips in the nearby area once or twice a month and making sure we see all the special events happening in Melbourne. Seek out opportunities with your employer about an overseas assignment or transfer. Often opportunities exist, you just have to go looking for them. There also might be exchange opportunities available to you. For teachers in Canada, they can often organize an exchange to another country. While you would still be working, you have the opportunity to live in a different country and explore that area. It's the Taj Mahal again! 😂 I may have told a porkie when I said the last Taj pic was the very last 😜 Want to know how we got a photo with us all standing infront and no one else around? Although our boys still managed to pull funny faces 🙈 Check out our NEW POST – Visiting the Taj Mahal with young kids – link in the bio. Also includes tips on when to go, which gate to use, managing inevitable selfie-requests and how all family members can appreciate it in their own way. If you travel for work, can you add on a holiday to it? Can you fly out your family to join you? You won’t have to pay for your airfare, hotel or meals, so the cost can be drastically less. Find a conference in a location you want to visit and pitch that to your company. Paul attended a conference in Monterrey, California one year and there was no question about me tagging along. Of course we added a few days after the conference to explore the coast. When I was a kid my Dad traveled a lot for work and he took me on a couple of Business trips. One time I got to go to Whistler (Canada) with him and we ran into Arnold Schwarzenegger in the elevator! Before we had kids, we came home from a 3 week trip to Australia and realized how much money we spend to get to a destination. Wouldn’t it be great if we could spend longer away, to really make use of the cost of getting there? This was the discussion that led to our 6-month trip to Africa and Southeast Asia in 2006. We had just purchased a house, were progressing in our jobs and starting to think about kids. But we yearned to travel more too. I didn’t have a permanent teaching contract yet, but Paul just asked his employer for the time off unpaid. Sure, they probably didn’t love the idea, but don’t be scared to ask. That trip cost us just over $20k all in. We used savings to fund that trip and I have no qualms about spending that money on that amazing trip. We organized a similar arrangement in 2015 when we took 6 months off with the kids. Have a pitch prepared for your employer about why they should grant you an unpaid leave. They can save a lot of money in salary and will receive a refreshed and energized employee on return. You can offer to work hourly as needed too in order to maintain client contact and earn some income. With the increasing role of technology in our workplaces and the acceptance of working from home, the logical next step is becoming location independent. The digital nomad craze is spreading quickly and many employees are able to continue to work for their employers from anywhere in the world. This is a lifestyle we often dream about. Not just for those in the IT fields anymore, there are many employees and entrepreneurs working from Bali, Thailand or Mexico. Even if you prefer to stay in your home community, the ability to leave behind the winter for a couple of months is pretty appealing. In the 4 hour workweek, Tim Ferriss advocates for employees to gradually start working from home more to get your employer used to the idea that you are just as productive out of the office as you are in. Even if you can’t work online, could you get a similar job in a different country? We know chefs and carpenters working abroad. Many of the suggestions to help you travel more as a family involve some substantial lifestyle changes. If you aren’t ready to make drastic changes to your lifestyle, you can still travel more. Make use of long weekends to get away. It doesn’t have to be a flight away, you could explore a city 5 hours away. When we return to the Toronto area, I want to do more long weekend trips to places like Ottawa and the National Parks near us. I know it may not seem as exciting as venturing far away, but there are probably places nearby that offer up a lot. Sometimes I take our nearby area for granted, but when I see it from a traveller’s viewpoint, I see what it has to offer. For example the other day I saw a blog post about the best hikes around Hamilton, Ontario and I have to admit I laughed. Hamilton is a steel town an hour from our home in Canada and certainly nowhere I would consider a holiday destination. But, reading through the article and seeing the photos, I realized that it actually does have a lot to offer. If you are a camping family, camping can be a great way to explore your local area. Living in Melbourne, we spend our weekends exploring the National Parks throughout Victoria. This is a great low-cost way to see a lot of places and we love our time in nature. When I was a 13, my Dad got laid off from his middle management position. Instead of jumping right back into the job market, my Dad decided to use this as an opportunity to do something they had always wanted to do: sail their small boat to the Bahamas as a family. They cashed out our education funds and we spent a year sailing from Canada to the Bahamas. It was the trip that showed me there were alternatives to the rat race and gave me my wanderlust. It was an incredible experience to spend so much time together, meeting other traveling families and island hopping around the Bahamas. There are lots of families traveling by sailboat or van for extended periods of time. Stressful transitions may not seem like the natural time to go traveling, but using these lemons in life as opportunities, can reframe a situation. Maybe you have decided to switch jobs? Maybe you have been laid off and given a generous package? Maybe you are about to start your own business? Before you jump into what is next, consider using that time to travel. Most us are confined to how much vacation time we have and money when it comes down to determining how much we travel. 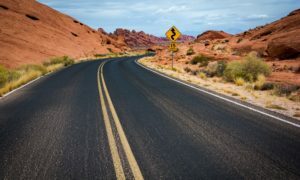 Some of the ideas above show how you can increase the time you have available to travel, but house swaps and house sitting are ways you can decrease the cost of your travels. We haven’t done either yet, but it is something we are very interested in trying in the future. With house swaps, leverage your home and swap it with another traveling family. 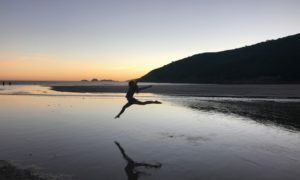 If you are like me and worried that no one would want to come to your hometown, read this post by our friend’s the 5 Globetrotters, who manage amazing swaps with a home base from small-town Canada. House sitting is also a really popular way to stay somewhere for free. While it may be harder for families to be accepted for house sitting jobs, there are a number of families who are doing it. We never regret the trips we take; we only regret those that we don’t. Life doesn’t come with guarantees and we believe firmly in not saving our travel dreams for later. We also think that traveling is the best education we can give our kids. Every day on the blog, we hope to inspire you to travel more with your kids. We hope this post has given you some concrete ideas to turn your travel dreams into a reality. Is there any other great ways you are traveling more with your kids? We would love to share them. Leave us a message in the comments below. Enjoyed Reading this Post? SIGN UP for more. Oh my gosh, YES! I love that you’re advocating for flexible working arrangements here (taking sabbaticals, working remotely, etc.) – in my former life, in the corporate world, I knew SO many people who were so married to their work that they saw no alternatives for travel. Or, even if they did know that – theoretically – long service leave or sabbaticals were available to them, they were terrified by the prospect of exiting the rat race for any period at all. F that, to be frank – you guys have the right idea. Thank you so much for sharing! Thanks Sheree! I know it can be hard to get your head around taking time off to travel, but it is something no one ever regrets! Loved the article. Unfortunately many of the tips are difficult for a location dependent doctor like me. Can you suggest some tips. I don’t work for a company and am s private practitioner, an eye surgeon, but am deeply interested in traveling more as a family. I blog at thefoodietrails.com and find quick getaways and staycations best for us. Hi Kuheli, I know it can be hard when you are location dependent to figure out how to travel more. Not sure exactly what your clinic set up is, but could you organize to take a period of time (a month) off and have co-workers cover for you? The one family I mentioned in this post that is on a one year RTW trip, she is an Optometrist and she has organized to have her partners cover her while they are away. http://whereistheworld.com/ Could you do work/volunteer for Medicins Sans Frontiers (or similar organization) for a period of time in another country? Hopefully you can find some creative ways to make it work for your family. Happy travels! Just love this post! Such an inspiration to see how much you and your family still travel together. The pictures are wonderful and this must be so amazing for the kids. Thanks for sharing! Thanks! We love seeing so many families doing epic extended travel. I really enjoyed really this post Dawn! I don’t have children but can imagine traveling as a family would be an incredible experience! Awesome Post Dawn, lots of good ideas there of how families can travel more. That’s awesome lots of great ideas. Thanks Kellen! We really wanted to give families some concrete ideas of how to do extended travel. So great that you have been able to find a balance that works for you and allows so much travel. We are still trying to figure out that balance! Thanks Lydia. Yes, costs add up quickly for a family of 5 and we are always looking for ways to travel more for less. Thanks so much. I think so many families want to travel more, but the logistics and finances are the biggest hurdles. I know it is for us! Awesome tips, I really enjoyed this post. This article is such an inspiration for all those who love to travel but can’t escape few months from their busy work schedules. Sadly, I am also one of them. But I’ll implement these tips and will go for a long weekend this time. Thanks for posting such an amazing article. Thanks Mirian. I know it can be hard to figure out who to travel more when you are working full time, but hopefully you can plan some epic long weekend trips!